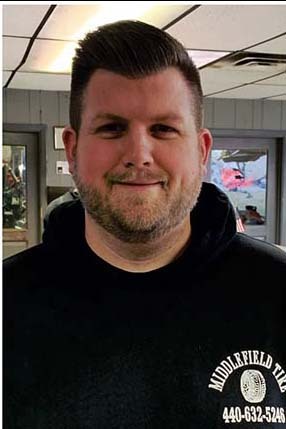 If you’ve been to Middlefield Tire, then you have probably met Matt Johnson. 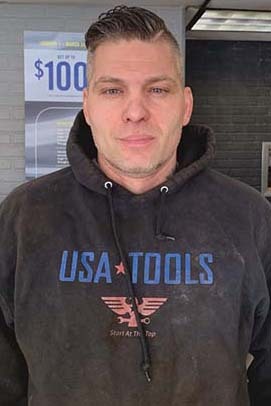 Matt has been with Middlefield Tire for eighteen years. Matt spends his time at work as a service writer, answering phone and helping customers. Having grown up the Parkman Township, he has lived in this area his entire life. In the little spare time he has, Matt is out on the greens golfing! When you go to Middlefield Tire, make sure you say “Hi” to Matt. He will take great care of you and we’ll take care of your vehicle. 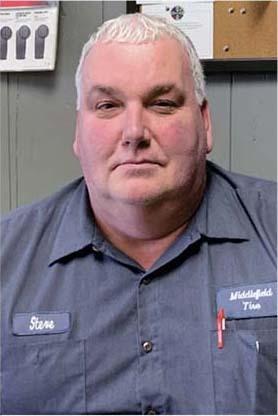 Steve Ayres has worked at Middlefield Tire for 13 years as an Auto Technician. After years of working on cars he recently moved to the Service Advisor Position. Steve knows the auto industry well. His father owned a similar business so he grew up around it. He’s been working on cars his entire life. Since moving in to the Service Advisor position you’ll find Steve at the front desk helping customers or cracking jokes! His favorite part of the job is getting to know everyone. Steve grew up in Champion. He has two children that are grown so he spends his free time visiting family, hunting, fishing and target shooting. Stop in to Middlefield Tire and let Steve set up your appointment to make sure your vehicle is fully serviced and ready for a road trip! 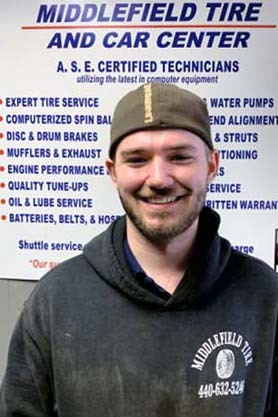 Middlefield Tire and Car Care Center would like to introduce you to Auto Technician Josh “Smooth” Luce. 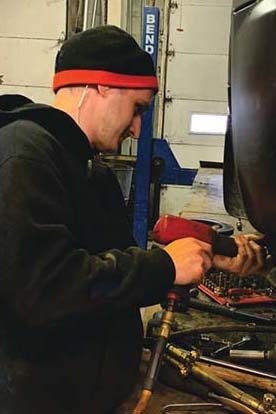 Josh began his career at Middlefield Tire 12 years ago. Starting off by doing tires and oil changes he has learned the ropes and has now taken on more responsibilities. Besides basic auto care, Josh does brakes, exhausts, bearings, sensors, tune ups and general mechanic work. Josh says is biggest challenge he has is staying up-to-date- on the latest automotive technology. Technology has redefined the way cars are manufactured, operated and maintained. Once you think you know it all something changes! In his spare time, Josh enjoys spending time with his family in Buffalo, NY and lifting weights. Stop in or call to make an appointment for a “Smooth” experience at Middlefield Tire. Kevin Stoops has been working for Middlefield Tire for five years. When Kevin started he was working part-time doing oil changes and tires. He has since graduated from Trumball Career Technical Center and is now a certified auto technician. Kevin grew up in Middlefield and has been part of the local community all of his life. He has always been mechanically inclined; after getting off the bus from school Kevin would go into his garage and putter around, working on his own cars. One of the things Kevin enjoys doing while not working is playing his guitar. Stop in to Middlefield Tire and it will be music to his ears! Zeth Tomaslak has been working at Middlefield Tire for two years. He currently spends two days a week at the front desk as a service writer, and the rest of the week working on tires, oil changes, brakes and wheel bearings. He said his favorite part of the job is getting to help the customers. Zeth grew up in Champion until age 15 when he moved to West Farmington. He said he’s a nice, outgoing guy who loves to help people and working on cars. In his spare time Zeth rides dirt bikes and goes fishing. Stop in to Middlefield Tire and say “Hi” to Zeth. You’ll always be greeted with a smile.